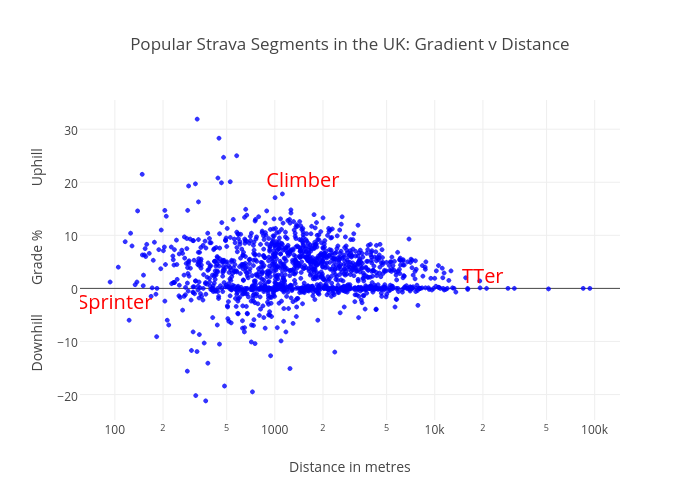 This is the third in a series of articles investigating factors that determine the best times on Strava leaderboards, using the popular Tour de Richmond Park segment as a case study. So far we have established that the fastest times have tended to be in the summer, with a decent wind blowing from the East. This blog investigates how atmospheric conditions affect the density of air, which, in turn, determines the aerodynamic drag that a cyclist needs to overcome. The power required to offset the mechanical forces, of gravity and rolling resistance, increases in proportion to speed, but the power needed to overcome aerodynamic drag rises with the cube of velocity. When riding fast, your effort goes principally into overcoming drag: maintaining a speed of 50kpm requires almost double the power of riding at 40kpm (503/403 = 125/64 = 1.95). The aerodynamic drag force is proportional to the density of the air though which a cyclist is pushing both body and bike. So you have a better chance of winning a KOM (or QOM) when the air density is low. A previous blog noted that most personal bests (PBs) on the Richmond Park leaderboard were set in the summer. The following chart superimposes, in red, the average air density in London on a histogram showing the number of PBs set in each month. The trough in the air density implies that aerodynamic drag is about 5% lower during the warmer months. So how much difference would a 5% reduction in air density make to your time round Richmond Park? For the same power, the cube of your speed can go up by 5%, resulting in a reduction of your PB time of 1.6%. For example, a cyclist completing a lap of Richmond Park in 16 minutes and 16 seconds (averaging 40kph) in December, would finish in 16 minutes dead, at exactly the same average power, in the less dense air of July. The difference is a second per minute, which equates to a saving of a minute for a one hour TT. The air density depends on temperature, pressure and humidity. The reason that air density is lower in the summer is that temperatures are higher: warm air expands. Monthly mean atmospheric pressure is pretty much the same all year round. Humidity tends to be higher in the winter. Contrary to what most people think, higher humidity reduces air density (because water vapour, H2O, with a molecular mass of 18, is lighter than the main constituent of air, nitrogen, N2, which has a molecular mass of 28). However, as the following chart shows, changes in humidity have a tiny effect on air density relative to changes in temperature. Although temperature is the primary determinant of seasonal variations in air density, both atmospheric pressure and humidity can vary significantly from day to day, so it is important to consider these factors when aiming for a KOM. The next chart shows the variability of air density, measured on a particular day, for an extreme range of temperatures, pressures and humidities. When Bradley Wiggins was going for the hour record, he became obsessed with the weather forecast, because even though it was possible to raise the temperature and humidity in the velodrome, he ideally needed a low pressure weather system to pass over the UK at the same time, as this would have further reduced the density of the air that he was riding through. On 2 May 2015, the air pressure in Manchester, which is close to sea level, was 1009hPa. If it had been about 3% lower, at say 980hPa (historically very low), he should have been able to go about 1% further, to exceed 55km. Since Strava segments tend to be outdoors, your priority should be to choose a very warm day, ideally with low atmospheric pressure and not worry too much about humidity, though higher is better. Returning to the leaderboard for the Tour de Richmond Park segment, the final chart shows the temperature and pressure on the days that the top 1000 PBs were set, split into quartiles of 250 riders (fastest riders in Q1). Observe that most records were set when the temperature was well above the annual mean of 12 °C, shown by the vertical red line. Slightly more PBs were set when the atmospheric pressure was disadvantageously higher than the average horizontal red line. There was no significant difference in air density for the top 250 riders versus the other groups of 250. Clearly the best place to be is the lower right quadrant. Finally, we have found something that would have allowed Rob Sharland to improve upon his KOM, as the prevailing conditions were 21 °C and 1022hPa – a warmer day with a lower atmospheric pressure would have helped him go faster – but then he might not have had the ideal wind conditions noted in the previous blog. The relative importance of wind versus air density is something I hope to come back to. The next blog explores the factors relating to the rider and bike that influence the time to complete a Strava segment. Two key aspects of the weather influence the time to complete a Strava segment: the wind and the air density. This blog considers the direction and speed of the wind. The following blog will examine how aerodynamic drag is affected by changes in air density. Clearly, on an exposed, arrow-straight segment, the most favourable weather would be a hurricane tailwind. Like other KOM hunters, I have searched for segments that align with the predicted wind direction when a gale is forecast, though I’ve usually ended up going kitesurfing instead. When the segment is a loop, such as the Tour de Richmond Park, discussed in the previous blog, the question becomes more interesting. Consider a light aircraft flying above the Richmond Park segment at an altitude of 300m. Any constant wind, regardless of direction, will result in a slower time than completing the circuit in still air. Why? Since any headwind slows down the plane, it hinders the pilot for more time than the tailwind provides assistance, resulting in a net increase in the total time. However, cyclists do not ride in constant winds. Trees, buildings and the terrain all affect the wind’s speed and direction. Variability is so strong that it is recommended that multiple anemometers should be positioned at intervals alongside the 100m track at important athletics meetings. All this means that it is quite likely that there are optimal wind conditions for all Strava segments. Most people suggest that a tailwind up Sawyers Hill is best for Richmond Park, as this part of the segment is an uphill drag that is exposed to the wind, whereas other sections of the route are much more sheltered. The bearing of a tailwind would be from just North of Easterly. Historically, this is not a very common wind direction for London. The following charts shows the prevailing wind direction over the year is Southwesterly. Now, if the wind had no effect on the Strava segment, we would expect the distribution of wind directions on which riders set their PBs to be similar to the historic distribution. So we are interested in the difference between the distribution of wind directions on the dates derived from the leaderboard relative the background average. The following chart compares the segment against the historic average annual average. The compass rose clearly shows a much higher frequency (13%) of the PBs of the top 1000 riders were set when the wind was blowing from the East and a relatively lower incidence in the opposite direction. The next hand chart “unwraps” the two curves to show the relative difference, which is statistically highly significant (p<0.01). A forensic analysis of the data confirms that the best wind direction for a PB around Richmond Park is indeed an Easterly tailwind up Sawyers Hill. So far we have not considered the strength of the wind. The next chart shows the average windspeed on the days that PBs were set, according to the direction of the wind. This shows a bias towards stronger winds from the East, consistent with the frequency of PBs. Combining this with the results of the previous blog, the following conclusions may be drawn. However good a cyclist you are, your best chance of achieving a high ranking on the Tour de Richmond Park leaderboard is to choose the evening or morning of one of the rare summer days when the wind is blowing strongly from the East. And, you guessed it, on the evening of August 2015 when Rob Sharland achieved his KOM, the wind was blowing at 11mph on a bearing of 80° . The next blog will examine how temperature, pressure and humidity, as well as altitude, change the air’s density. This is the principal environmental factor affecting your aerodynamic drag, when you are going for a KOM.